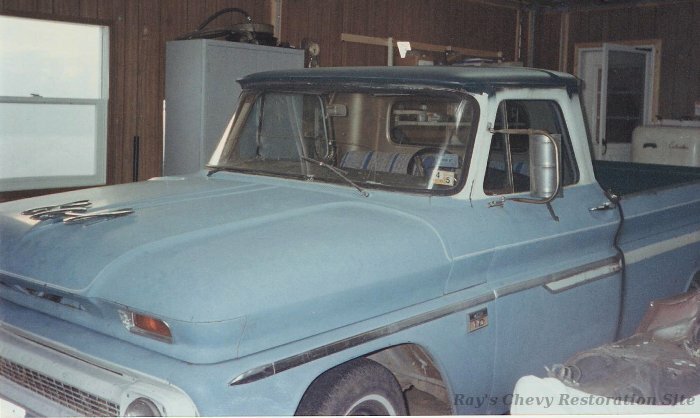 This photo was taken shortly after dad purchased the truck from his brother (my uncle). 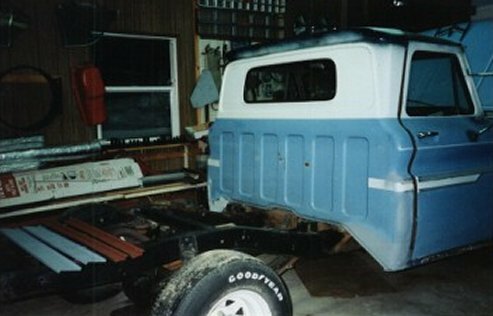 My uncle bought it when he was living in Texas and drove it up to Maine when he moved back. Being a Texas truck, the frame was rust free. The lower portions of the front fenders and cab had a small amount of rust, with the rocker panels being the worst. It appears as though the truck had an older re-paint in it's original light blue that had become rather faded & chalky in the Texas sun. My uncle was going to paint it green and had already started on the top of the roof and inside the bed. 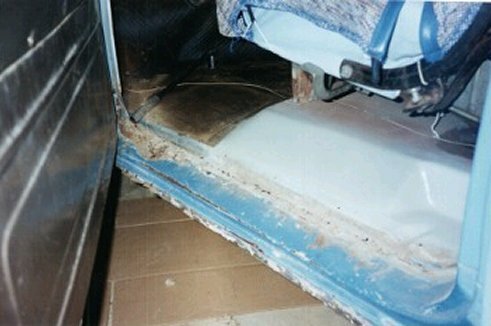 The metal interior panels were in need of a paint job and the seat was very worn out. The truck still had its original (as far as we know) 283 engine and 3 speed manual transmission. 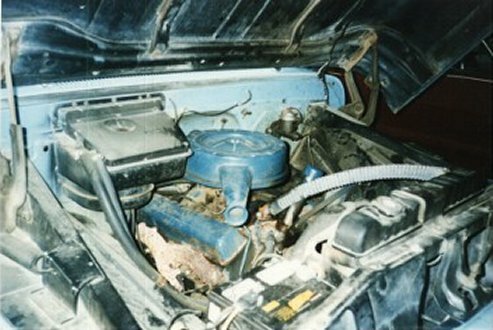 Someone had sprayed blue paint on the air cleaner, valve covers, and oil filler cap. And the upper radiator pipe had been replaced with a universal flex hose. But aside from those minor changes it appeared to still have most of it's original parts. 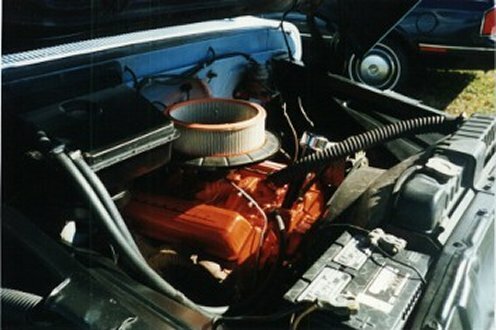 One of the first things we die was to clean up the engine compartment a little and gave the engine a coat of Chevy orange paint. NOTE: We later learned that Chevy truck engines were not painted orange like the car engines in these years. The correct color for the '66 truck 283 is gray. And sure enough, there are still traces of the gray paint on the oil pan and other areas that didn't get repainted. See the table on photos page 4 for more info on the factory engine colors in these trucks. The rocker panels were full of bondo. Once that was removed, it revealed the large rust holes. It appears as though the rockers got some mud inside them that trapped moisture and caused them to rust from the inside out. Since the rust was limited to the straight sections of the rocker panels, I opted to have a friend with a sheetmetal brake make us some home-made patch panels. Those pieces are shown in the above photo (in red and gray primer) laying on the frame. 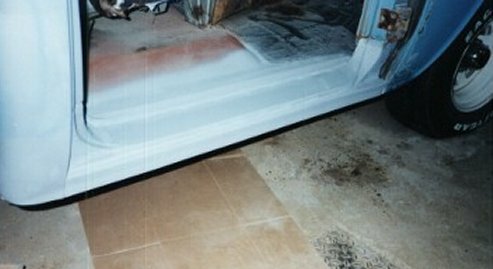 The RH rocker panel after repair. The LH side received the same repair job. 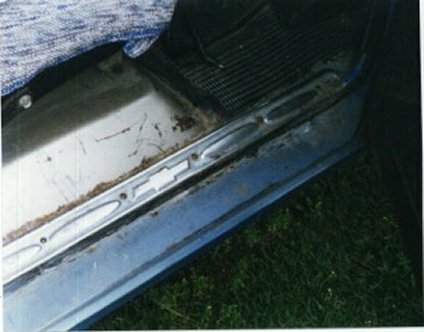 A few years after doing this work, Dad bought a 66 parts truck that had a pair of new GM rocker panels laying in the seat. We put them on a shelf in the garage to keep just in case the rockers ever need to be repaired again. The lower rear corners of the front fenders had some similar rust damage from mud collecting in the boxed in reinforcement braces in this area. That rust was cut out and repaired by welding in some home-made patch panels.